On Target has proudly and safely served the Anne Arundel and surrounding Maryland Counties shooting community for over 31 years. First established in Glen Burnie, Maryland in 1982, On Target relocated to a new state of the art facility in 1987. Since then, our facility has been continuously updated and maintains one of the most comfortable and safe environments in Maryland for indoor shooting and luxury gun club memberships. .
Our location in the Severn Square Shopping Center in Anne Arundel County offers convenient access and an outstanding collection of handguns, long guns and accessories for use on the shooting range. At On Target we not only display one of the largest selections of handguns in the State of Maryland, but offer our members and the general public the opportunity to utilize our 25 yard indoor range. Our range accommodates 16 shooters in a comfortable and safe setting at any time of the year. 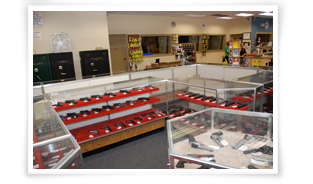 We offer a large selection of handguns that can be rented for use on the range. For a single fee you sample a gun or as many as you wish for as long as you wish (ammo not included). For over 27 years we have offered Basic Handgun Safety Course consisting of two hours of classroom instructions and one hour of range time with the instructor to teach safety, maintenance and care, as well as proper use and protection of your gun in your home. The original people who organized and opened On Target in 1982 are STILL the owners today and value the support that the shooting community has shown over the decades. Safety has always been and always will be our primary concern and EVERYONE is required to follow the rules to prevent accidents. So, please don’t be offended if you are reminded by the Staff of any infractions. If you haven’t been to visit us, please come. Let us know that it is your first visit so that we can show you around. If you are an old-timer, WELCOME BACK!